San Sebastián is one of the most beautiful cities in the world. An incomparable setting where gastronomy unites with culture and spectacular beauty. A place that must be visited and which is just 7 km from the hotel Sagarlore. The first stop is the Playa de la Concha – The Concha Bay – a magical place where a stroll is pure pleasure. The iconic barandilla – railings -, the amazing views and the soft sand make this beach into a real paradise… do not forget that it has just been named The Best Beach in Europe on TripAdvisor… You`re already dying to visit aren`t you? If you want to enjoy the fantastic views of the city and the bay even more we recommend that you go to the top of Monte Igueldo on the traditional funicular railway and admire the panorama from there. A jaw-dropping experience. 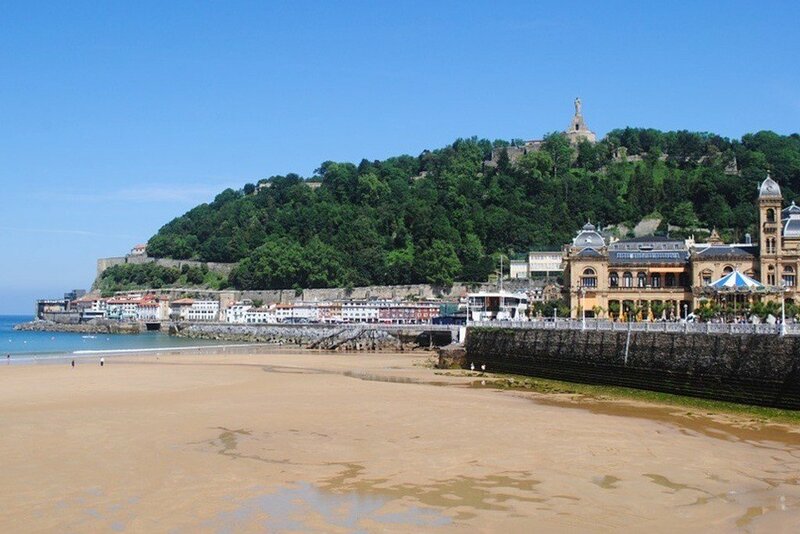 Gastronomy is another of the most important aspects when visiting San Sebastián. Thousands of tourists enjoy pintxos (tapas) every year along with the culinary traditions that inspire this city. The Parte Vieja (Old Quarter) and Gros (district across the river) are the reference in the world of food in this the provincial capital. Constantly crowded with locals and visitors alike enjoying the delights, both traditional and modern, that are cooked up in the hundreds of bars and restaurants. Arzak, Akelarre and the Mirador de Ulía are some of the Michelín starred restaurants in the city, a must do for those with the most demanding palates. San Sebastián is also a city full of culture. El Peine del Viento – Comb of the Winds a sculpture by Eduardo Chillida - is one of the most visited and photographed places in the city. There is another work of art - Construcción Vacía by Jorge Oteiza - just across the bay, on the Paseo Nuevo to be specific, almost alongside the famous Aquarium donostiarra which has a 360º tunnel showcasing a large variety of marine animals as well as Bull sharks. The Festival Internacional de Cine de San Sebastián is one of the main events of the year for the city. Hundreds of actors and movie stars visit the festival to promote their latest films and at the same time enjoy the gastronomy. It is not too difficult to bump into a Hollywood star anywhere in the city at this time… The Quincena Musical (Orchestral Music Fortnight), the Regatas (traditional rowing finals), Sagardo Eguna (Cider ferstival) and Jazzaldia (Jazz and modern music festival) are some of the events that fill the city with a unique atmosphere. Many options to enjoy San Sebastián in different ways. Which ones will you choose?